BetterTaxi offers three booking options that fit every type of traveler. We have our Taxi Service, Premium Transfer, and Business Transfer. The cost of a taxi varies depending on distance, traffic, route, and number of passengers. These prices also depend on local tariffs and standard Ingolstadt taxi fares. For groups of more than 7 people check out our event service. 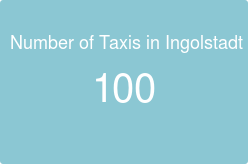 For city trips in Ingolstadt the regular taxi booking has fastest availability. Prices are solely determined by the taximeter in the car while our prices are trip related estimates. Longer rides and rides crossing the tariff borders are not regulated and hence are offered at guaranteed fixed prices. In certain circumstances also for city rides your best choice may be a fixed price offer. Some examples are: 1. You need to handle the booking and payment for another person. 2. You are simply unsure about possible extra charges on-top of the regular distance related taxi fare. or 3. You have a special need like a getting the driver to provide a baby seat for infants.